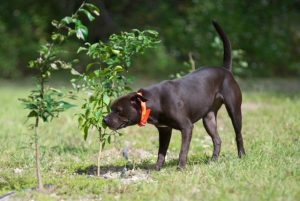 The use of canines or “sniffer dogs” is again being investigated by the U.S. Department of Agriculture (USDA) for early detection of HLB-infected trees. Through the HLB Multi-Agency Coordination (MAC) program, USDA Animal and Plant Health Inspection Service (APHIS) has invested millions of dollars in the research and training of detector canines for finding HLB-positive trees. A recent full-day meeting in Riverside that included APHIS and Agricultural Research Service representatives, along with California citrus industry leaders, has paved the way to test the dogs in California. Results from previous testing have shown that properly trained dogs can identify citrus trees in a very early stage of HLB disease with as much as 98 percent accuracy. The dogs are most accurate when HLB is not overwhelming, and is found only in a small part of their sample. The dogs are coming to California because the disease has been geographically isolated and outbreaks have been limited to individual trees. Schulz says canines are expected to be on the ground by December 2018 or January 2019. The initial testing is being overseen for the USDA by Tim Gottwald, a Florida-based USDA researcher. “Dr. Gottwald is the principal investigator for the HLB MAC project, and the dogs are owned by APHIS, and so the work over this next probably 18 months is going to be done under that regime,” explained Schulz.